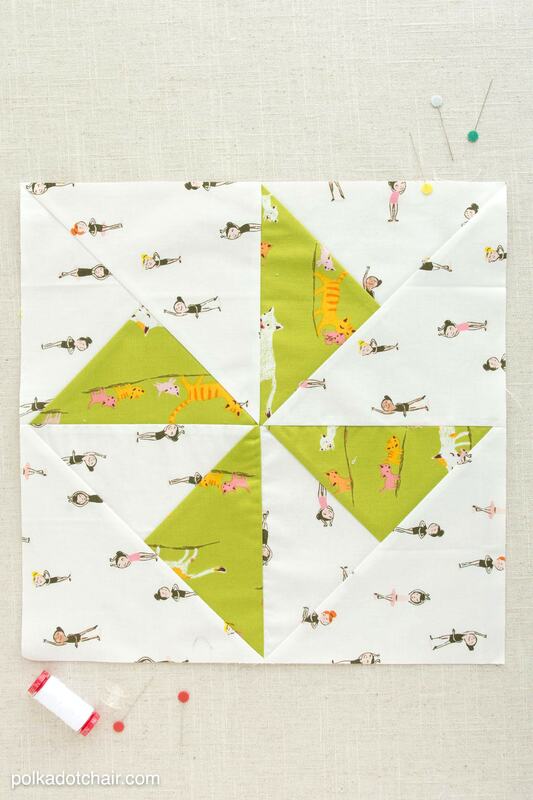 Today I’m very excited to be sharing with you the January Quilt Block of the Month. 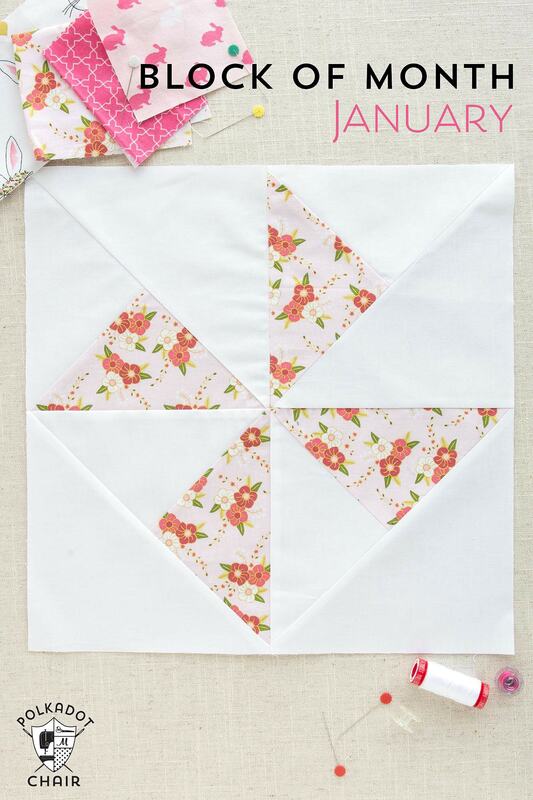 This month we are making a very simple Turnstile Quilt Block! This is block #5 of 12. The turnstile block is a simple combination of a Half Square Triangle and a Quarter Square Triangle. 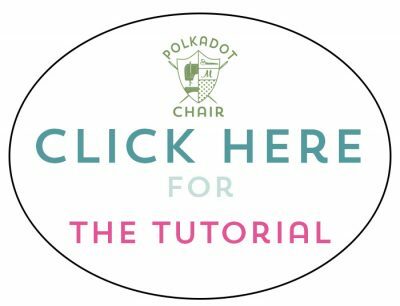 I hope you’re ready for the January block in our Quilt Block of the Month series here on the Polka Dot Chair! So far I’m pretty proud to say that I’m all caught up with my blocks, which is pretty good considering I’m making 4 different quilts! 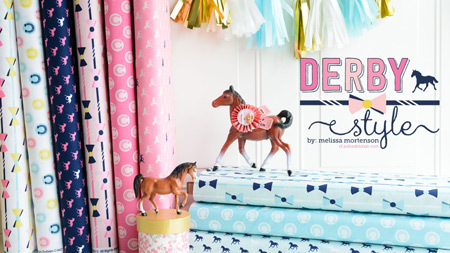 I’ve also been busy the last few weeks trying to re-photograph and re-format my sewing patterns. So far it’s taken almost the entire month of January, but I’m inching closer to getting those babies sent off to the printers! 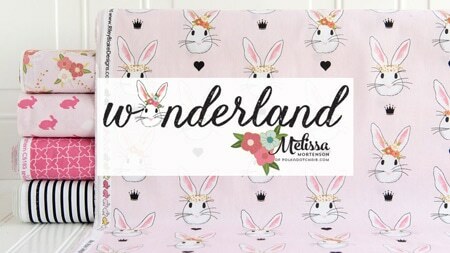 I’m also feverishly sewing with the few scraps of Wonderland that I have so far. I think I have about 1/2 a fat quarter of each print and deciding how to use them has NOT been easy. 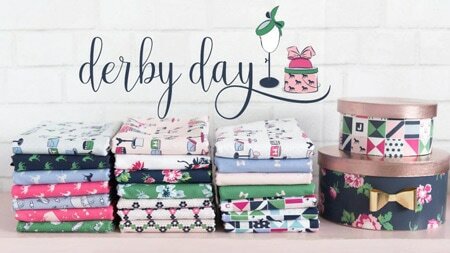 I’ll have photos to share online very soon, if you have a shop that is selling the fabric you’ll be able to use them to promote the fabric, which is due to show up in a few very short weeks! I think that this months block is the simplest one to date. If you ever need to quick piece a quilt I think this block would be the way to go. 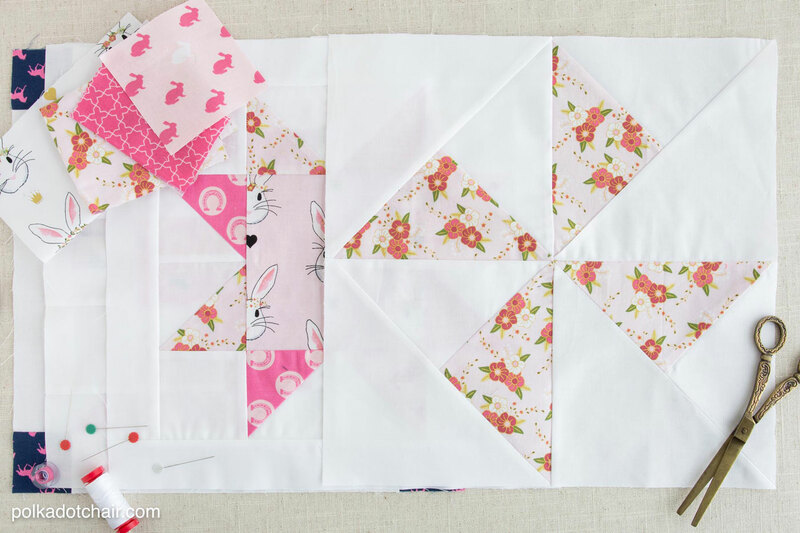 You only need to cut 4 pieces of fabric and there is minimal piecing involved. I am on my way to my quilt room (the basement archives) to get this block cut and done!!! Thank YOU! 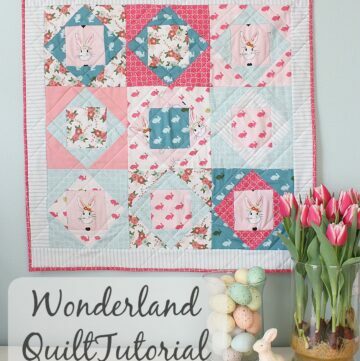 Melissa, a huge thank you for your tutorials….I am new to o quilting, carrying on my Granma’s tradition…your instructions are clear, concise, and easy!!! Thank you from the bottom of my heart!!!! When I think of the hours she used to spend hand cutting each little piece of scraps, hand stitching them all and hand sewing the quilt tops, honestly, I don’t think I could do it….many blessings to you and your family!!! 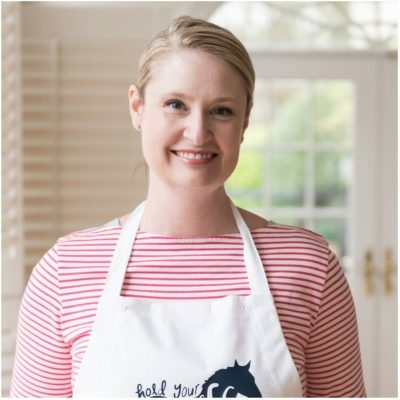 I just stumbled onto your site and thrilled to say the least! I too am new to quilting and somewhat apprehensive in starting a new project. 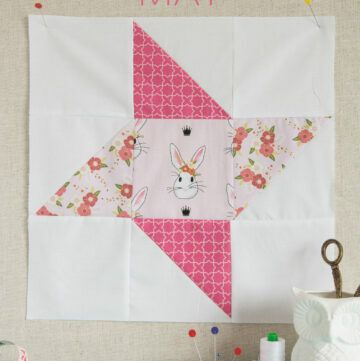 When I saw your quilt block for this pattern and it’s colour combination I immediately felt a sense of relief. Something manageable without great stress! Loved the beginnings of your your Star Wars quilt for your son and would love to make one. Would you be so kind as to share your finished creation with us when completed? 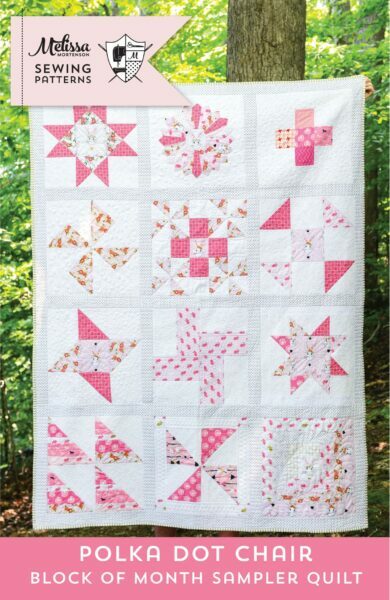 I am new to block of the month quilts and would love to do one but I have no idea how to begin. Where do you start how do you know how much material you would need to even begin? I have been piecing quilts for a very long time. So please give me a starting point. Lol or do I just jump in anywhere? I do love you illustrations and step by step how to. They are easy to follow great for beginners as well as advanced quilterz. Yes, just jump in anywhere. 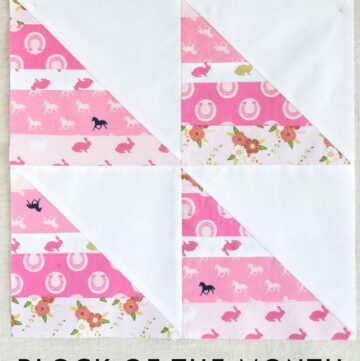 This block of the month is over a year old now, so all of the blocks are online. 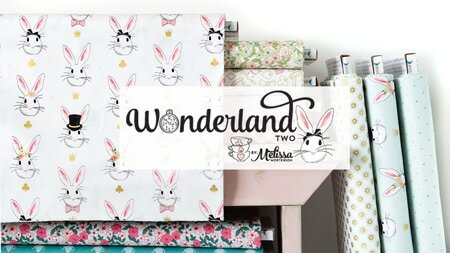 If you want all of them in a printable format you can buy one at shop.polkadotchair.com – since it was a “sew as you go” block program there was not a fabric requirements post, it was designed to be “scrappy” and a kind of “use what you have” type quilt. Hope this helps!